Local projects which bring together art and pedagogy in the local context. During 2016, ACVic has managed and coordinated the Laboratori POROSITATS, supported by the Programa d’Arts Visuals de la Diputació de Barcelona and developed in collaboration with the Ajuntament de Terrassa, the Ajuntament de Granollers and the Ajuntament del Prat de Llobregat. The Laboratori Porositats is presented as a work-sharing space, with the objective of establishing a viable project which connects art and education to the local context in which the project will be developed. 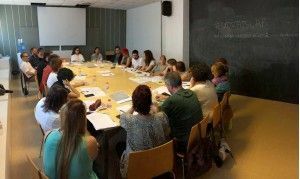 In the towns of Granollers, Prat de Llobregat and Terrassa, where the laboratory took place, specific working groups were set up, groups which, between February and July of 2016, organised various sessions in order to set out a project specific to each town. These working groups were set up with the participation of experts in different municipal fields, artists, teachers, heads of cultural departments, heads of educational departments, or agents from outside these departments. Laboratori Porositats has been divided into two phases. The first (February – July 2016) was a discussion phase, directed towards setting out the baselines for the project to be completed during the second phase (September 2016 – June 2017). Most of the working sessions which took place in each town represented an attempt to combine research, training, and debate among all those who attended, and were conducted by Anna Crosas (Diputació de Barcelona), Ramon Parramon – Maite Palomo (ACVic), and experts from each participating municipality; Lluc Mayol – Cristina Castells (El Prat de Llobregat), Susana Medina (Ajuntament de Terrassa), and Glòria Fusté (Museu de Granollers). The intention of these sessions was to define, through dialogue, an experimental way of working, directed towards setting out a cooperative project. In these sessions, participants decided what they would do, how and when to complete the work, and with whom; all with the intention that group members should feel involved in the construction of their projects. The second phase has seen the start of these defined projects; Modulacions – La Paraula in El Prat de Llobregat, La Calaixera in Granollers and TERRA-OASI in Terrassa. All of these projects were begun in September and October of 2016, with different considerations and resources taken into account according to the reality of each location, and will be concluded between May and June of 2017. As an element common to each project, all projects will be taken as pilot experiences, with a view to reproducing and reconsidering them in future editions. Lluc Mayol, Visual Arts Programme, Ajuntament del Prat (/UNZIP) and Cristina Castells, Visual Arts Head Officer, Ajuntament del Prat; Esther Merchán, Outreach worker/UNZIP Arts Visuals; Cristina López, director of Biblioteca Antonio Martín; Clara Illa, Assistant Officer Biblioteca Antonio Martín; Laia Campañà, director of Escola d'Arts el Prat; Marta Velasco, Students Support Officer. El Lloro, Serveis de Joventut; Cuadri Morillas, Education Officer, Ajuntament del Prat; Virginia Morillas, Youth Officer of Ajuntament del Prat; Hanna Alda Müller, Art Teacher at IES Baldiri Guilera; Jaume Bosch, director of Institut Escola del Prat; Sandra Gallardo, director of Escola Prat 1; Violant Olivares, Head of Studies, Escola Prat 1 Núria Inés, Youth Group Teacher, Escola d'Arts el Prat; Xavier Blanch, Teacher, Institut Escola del Prat; Xavier Maresma, Teacher, l'Institut Escola del Prat. Glòria Fusté, Technical Director, Museu de Granollers; Maria Permanyer, Technical Director, Museu de Granollers; Imma Saurí, Technical Officer, Museu de Granollers; Laia Casanova, Roca Umbert Espai d’Arts; Teresa Llobet, Associació Cultural de Granollers, Ermisenda Soy, artist, resident at Roca Umbert; Jaume Parera, artist teacher; Pau Farell, artist and teacher; Clara Rebollo, mediator, Projecte Feedback and Relats de l’art, Museu de Granollers; Toni Cirera, guest expert specialising in educational materials; Anna Estany, artist and teacher, Institut Celestí Ballera de Granollers. Susana Medina, Ajuntament de Terrassa; Laura Fusté, Ajuntament de Terrassa, Youth Department, Coordinator at BaumannLab; Imma Vilches, Ajuntament de Terrassa, Coordinator of Barris Creatius; Anna Llongueras, Head of Schools, Terrassa; Elena Dinarès, Educational Promoter for the Ajuntament de Terrassa; Marta de Juan, Museu de Terrassa, Public Relations; Gabriel Verderi, Director of Escola Municipal d’Art i Disseny; Núria Marín, Head Teacher at CEIP Montserrat; Maite Márquez, Head of Secondary School Studies, Escola Cultura Pràctica; Raquel Moral, Art Teacher at Escola Cultura Pràctica; Cesc Sonera, Art Teacher at Escola Joaquima de Vedruna; Marta Ruiz, INS Blanxart (batxillerat artístic). Head of the Art Department; Sílvia López, artist and member of the association “Windown.org”; Juan Carlos Estudillo, head of Aprop'art; Paulo Cacais, TigoMigo gallery.